Do you have a urostomy? If so, the 839001 large rings are recommended for you. Do you have an ileostomy? It's likely that the 839002 small Eakin Cohesive rings will best suit your needs. If you have a colostomy and wear a one-piece pouch, the 839005 slim rings will be a great option. Tip #2 Do You Have Limited Dexterity? If it's difficult to do fine motor skills with your hands, then the 839006 StomaWrap will be easiest to use. Just take the paper off and wrap it around the stoma and overlapping any excess material. Tip #3 Is Your Stoma Large or Oval Shaped? If your stoma is really large or oval shaped making it hard to fit with the traditional Eakin stoma rings, then the StomaWrap 839006 will be the best product to use. You can save often by buying in bulk as retailers may give "bulk" discounts. Also, watch for sales. As mentioned earlier there are similar products made by Hollister, Coloplast, Nu-Hope and more that could be less in price and may even be the better choice for you. It's important for you to sample these and make your own decision. Let's be frank, Eakin rings are not cheap. Many people hesitate to buy them because they are so costly. An easy way to get the most bang for your buck when using Eakin Cohesive Seals is to use half of the ring. Take one half and stretch it and mold it to fit the desired area of skin (not everyone has this luxury and must use an entire ring each time). If you can make this work, you have just cut your cost of these rings in half! It is safe to say that every ostomate has heard of Eakin cohesive seals at some point. They may or may not use them or maybe an analogous product from another manufacturer. Versions of Eakin Cohesive Seals are offered by Coloplast, Hollister, Nu-Hope, Marlen, Cymed and more! Eakin accessories are a widely used and trusted ostomy accessory around the United States. We have some important points that can help you decide which Eakin ostomy accessory is best for you. Did you know there are four different kinds of eakin ostomy accessories? They have designed them to be different diameters and thicknesses to best fit your individual needs. 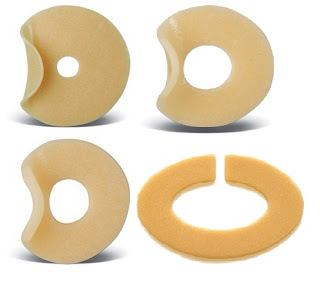 839001 Large Eakin Cohesive Seals 4" - Large cohesive seals for urostomates to cover a large area of peristomal skin and can be used with deep convexity fitting situations. 839002 Small Eakin Cohesive Seals 2" - Designed for those with high fluid content and to resolve leakage problems. This can also provide "soft" convexity. 839005 Slim Eakin Cohesive Seals 2" - Like the 839002 but not as thick. Designed for those who change their pouch often and have convex ostomy pouches. Use these with Pre-cut ostomy appliances to get an exact fit. 839006 Eakin Cohesive StomaWrap - Designed for ostomates with large or oval shaped stomas as well as those individuals with limited dexterity. This design also facilitates a quick pouching routine.